يقع Geelong Riverview Tourist Park - Aspen Parks في Belmont, جيلونج, هو خيار شائع بين المسافرين. يقع الفندق على بعد 1 km من مركز المدينة، ويؤمن الوصول إلى أهم مراكز المدينة. إن سهولة الوصول من الفندق إلى المعالم السياحية الشهيرة الكثيرة في المدينة كمثل ‪Barwon Grange‬, ‪Simonds Stadium‬, ‪The Heights Heritage House‬ هو استثنائي بحد ذاته. استمتع بالخدمات الراقية والضيافة التي لا مثيل لها بهذا الفندق في جيلونج. هذه بعض الخدمات الموجودة في هذا الفندق: مرافق مخصصة لذوي الاحتياجات الخاصة, تسجيل وصول/خروج سريع, تخزين الأمتعة, واي فاي في المناطق العامة, صف السيارات. استمتع بوسائل الراحة الراقية في الغرف أثناء إقامتك هنا. بعض الغرف تتضمن تلفزيون بشاشة مسطحة, غرف لغير المدخنين, مكيف هواء, تدفئة, شرفة/ تراس لمساعدتك على استعادة طاقتك بعد يوم طويل. يمكنك طلب اللائحة الكاملة للخدمات في الفندق ومن بينها حمام سباحة خارجي, ملعب للأطفال, حديقة, غرفة ألعاب. مهما كانت دواعي سفرك فإن Geelong Riverview Tourist Park - Aspen Parks هو خيار ممتاز لإقامتك في جيلونج. We got everything we need in the room, cleaned as I always check the room if any un necessary hair on bed sheet or bed bugs before unpacking. Staff was friendly. Coffee shop just right outside for breakfast. The location is near park and river, but a short drive to town & beach. It is well equipped but no daily housekeeping. The master bed is too soft. The place is clean and comfortable. I am really pleased with booking this place. I like the layout and is surprise to find heating pad on the queen bed too. All kitchen utensils are new and clean and you have everything that you need. The only complain is I can't find it on google map. When I use the google gps, it leads me to another location nearby. The name "Discovery Park" is also not clearly displayed. I think it was shown as Kiewa View and then you see a little vertical banner that has the name Discovery Park, but when there's no wind blowing and when the banner collapse, there's no way to see it clearly. I hope the management can improve on that. Other than that, I like this place and it's definitely value for money. Was like living in a small house. Nice to have a full kitchen. Shower/spa tub was nice. We didn't have a chance to enjoy the spa tub though. Only complaint with the place was the free wifi didn't really work. It was either really slow or would connect but then not work. The cabin is a good size for a group. Well equipped kitchen and groceries shopping is within 10 mins driving. Overall very good, cosy and comfortable except for the wifi connection was not available during stay. The cabin was nice and comfortable and it felt like home. Suitable for groups travellers especially families with 4 children. The cabin can be occupied by 6 persons. The surrounding was quiet and peaceful. The garden view was nice and also there are games room with arcades and pingpong table provided for family fun activities. We arrived at 10 PM and there is no staff in the reception. However, they left the key and card on the door to allow us to enter the room. Basically it is a lovely apartment, and very clean and easy to park. However, the surrounding was very dark, and the direction was not very clear to follow. It is not too difficult to find our way there with a GPS. The first thing we noticed is the room is newly furnished. My youngest boy like the most is the Jaccuzzi in the room. He soak in the pools of water until the dinner time for both nights. They loved the hotel the most during our 10 days trip in Victoria. The spa cabin was wonderful. It was a cold night and the cabin still feels warm and comfortable. The cabin has simple and modern decor and mostly importantly the place is clean and spacious. We could have dine out but we decided to buy takeaway so that we can enjoy our time in the cabin. This spa cabin is great whether you want a romantic weekend getaway or doing night stop while on holiday! In fact, my flight was cancel and unable to reach at 3dec. The staff is kind enough to let me get a replacement on 4dec, free of charge. I m really appreciate it with her great help. Thanks you. Reached at Discovery Parks about 12am mid night, key was ready at mail box outside reception office, thank you for didnt forget us. Place is nice and near town centre. Everything is perfect! They have everything you asked for the price that you have paid such as spa bath, in room facilities kitchen, swimming pool, bbq area and friendly staff. Will definitely stay here again! We were travelling and stayed in Geelong for 10 days. The cabin we had was very spacious and very clean. Overall it was very comfortable although the bed was not that great. The only down side was visiting tradies during the week. On our second week there were a bunch in the next cabin who sat on the patio and got drunk and the more they drunk the louder they got, so be warned if staying for a week and you have young kids. Wonderful experience with this place & we really love it so much. The room is clean and equipped with all the things you need. Supermarket is just a short driving distance. Really enjoyed and hope to come back here again . 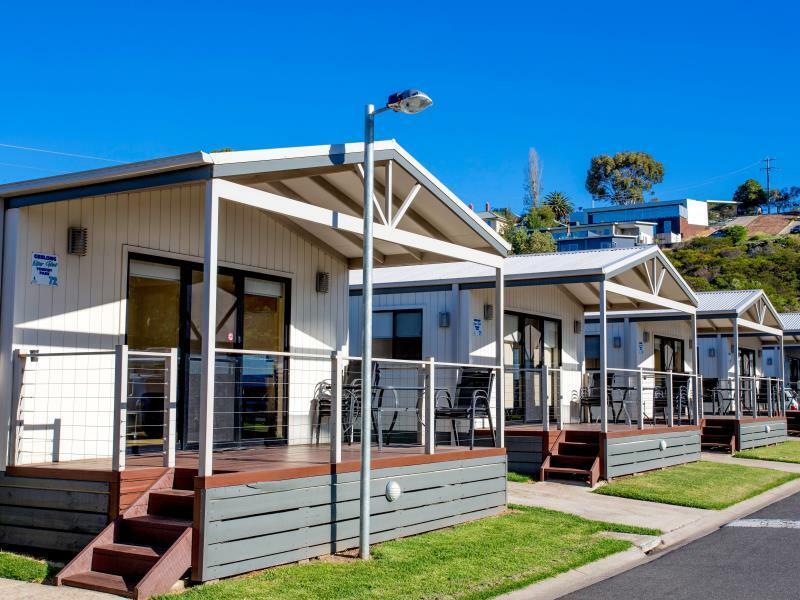 I searched high and low for accommodation that was going to be affordable but slightly high end for our short stay in Geelong and I'm pleased to have found just that. On a previous trip we had stayed at a beautiful apartment in the centre of town, but which cost us double than a stay at the tourist park. I booked one of the spa units and it was so much better than I had imagined it would be. The cabin was neat, tidy and modern looking and had everything we needed in the kitchen to prepare our own meals. The spa itself was huge so we took advantage of that and had a beautiful spa every night of our stay (may not be an ideal set up for the elderly due to the height of it and having to get in it to use the shower also, but for a young couple it was perfect). Staff kept to themselves but were extremely helpful when we needed them. The location of the park was also good, only a short drive to the centre of town and set back far enough away from the road which made for a peaceful night sleep. The only thing I would fault it on was the bed, it was quite lumpy and uncomfortable, but this was minor and although not my ideal bed it may be alright for some. I will definitely rebook one of the cabins in the park when I return to Geelong. A thoroughly enjoyable stay.